Dr. Donald Fisher. Photo by Emily Fister. 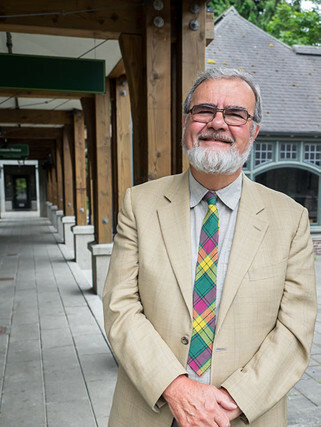 Dr. Donald Fisher was appointed Vice-Principal of Green College at UBC on September 1, 2014. He occupied the role of Acting-Principal of Green College for a calendar year from July 1, 2015 while the Principal Mark Vessey was on sabbatical leave. Prior to his appointment as Vice-Principal, Dr. Fisher had a long history with the College, having previously served as a Faculty Member of Green College since 1995. Dr. Fisher obtained his B.Soc.Sc. in Sociology at the University of Birmingham and his PhD. in Sociology of Education at the University of California, Berkeley. He came to UBC in 1976 as an Assistant Professor in the Department of the Foundations of Education. Dr. Fisher was promoted to Professor in 1992 in what became the Department of Educational Studies. He held Visiting Professor positions at the Institute of Education, University of London in 1982/83, University of Waikato, New Zealand in 1989/90, University of Lancaster in 1996, Instituto Superior de Ciéncias do Trabalho e da Empresa, University of Lisbon, Portugal in 1996, University of Sydney, Australia in 1997, University of Western Ontario in 2002/03, Centre de Sociologie Organizations, Science-Po, Paris in 2007 and the University of Melbourne, Australia in 2008. He has served as President of four national organizations: Sociology of Education Association (USA); Canadian Foundations of Education; Canadian Society for the Study of Education; and the Canadian Federation of the Humanities and Social Sciences. Before taking up his position as Vice-Principal of the College, he served as Head and Chair of the Department of Educational Studies. He was elected as a Senator at Large of the UBC Senate for the triennium 1999-2002. Using a historical sociology approach, Dr. Fisher's research focuses on the impact of large scale philanthropy on university education, boundary work within the social sciences and between that group of disciplines and other knowledge areas, academy-industry relations and the marketization of university systems, and the formulation and implementation of higher education policy. His research has been supported extensively by the Social Sciences and Humanities Research Council of Canada. He has published widely in the fields of sociology of education, history of education, political economy, higher education and policy studies. Earlier work on philanthropy and boundary work includes monographs on The Social Sciences in Canada (Wilfid Laurier University Press, 1991), Fundamental Development of the Social Sciences: Rockefeller Philanthropy and the United States Social Science Research Council (University of Michigan Press, 1993), and a co-edited volume on The Development of the Social Sciences in the Unites States and Canada: The Role of Philanthropy (Ablex, 1999). More recent work on academic-industry relations, marketization and higher education policy includes a co-authored monograph on Canadian Federal Policy and Postsecondary Education (Centre for Policy Studies in Higher Education and Training, 2006) and a co-edited collection on The Exchange University: Corporatization of Academic Culture (University of British Columbia Press, 2008). His most recent book is a co-edited volume on The Development of Postsecondary Systems in Canada: A Comparison between British Columbia, Ontario and Quebec, 1980-2010 (McGill-Queen's University Press, 2014). He is currently working on a book that will document the development of the social sciences in Canadian universities from 1950 to 1990. Dr. Fisher is married to Susan and they have two daughters, a son and six grandchildren.